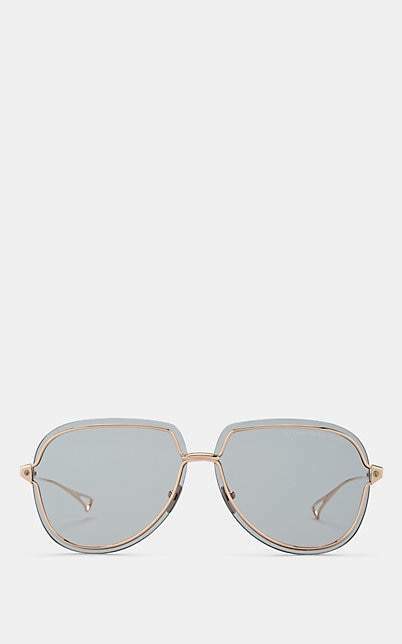 Crafted of polished rose-goldtone titanium, Dita's Nightbird-Three sunglasses are equipped with UV-protective grey lenses. Made by master eyewear artisans in Japan, this statement-making frame is inspired by the concept of floating. Aviator style. Nose pads. Grey lenses with anti-reflective coating. 100% UVA and UVB protection. 62mm eye size. 10mm bridge size. 145mm temple size. Available in Rose-Goldtone. Titanium. Made in Japan. Includes hard protective case and cleaning cloth. 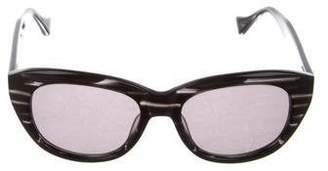 Dita Women's Nightbird-Three Sunglasses - Silver A great designer gift. Shop Dita at Barneys New York.